This is the post where I attempt to wrap things up a bit. But I'm feeling way too random and I totally lost my focus. Well, this isn't a one-shot thing. For me, anyway, a good pantry is built up over time. In general, I try to be replacing what I'm using as part of my weekly grocery shopping. And I try to allocate a percent or two of my weekly grocery budget to building the pantry. 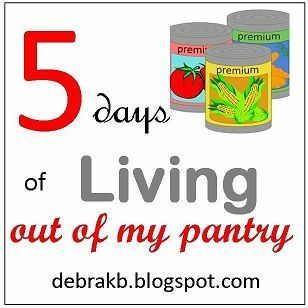 When I'm in a $35/week grocery budget cycle, it's tough... but I can still get a pound of beans or a single can of tuna, above and beyond what I plan to serve that week. When I'm spending $100 per week, that means I try to put $5-10 a month into my pantry. I also try to hit Sam's Club every couple of months and purchase something there... a 25# bag of flour, popcorn, or rice, or one of those ginormous packages of yeast. I allocate roughly $50 every other week to Bountiful Baskets. That lets me get two baskets (which is all the produce I usually purchase for my family) and an "extra" or two. When it is tomatoes, I get a bunch canned. I've also canned peaches, frozen apple slices, and frozen mangoes from those extras. I sometimes can manage to preserve something out of the baskets too. When neighbors are desperately trying to get rid of zucchini, I'll shred and freeze a whole lot of that. When we can get over-ripe melons for nothing (or next to it) from the farmers down in La Junta, I chop and freeze those too. I purchase mark-down meat, and come home and do a mini freezer cooking session. A crew-mate posted a bunch about that topic in 5 Days of Freezer Cooking. Where do I put all of this? Well, that is tricky. We don't have a ton of storage available in our kitchen. I do have food stored on the tops of my cupboards in the kitchen. We have food stored in boxes under our bed. We have a good sized chest freezer in our living room. Organization is not my gifting. One of my crew-mates posted about organizing your pantry earlier this week though, as part of her 5 Days of Home Organization. Your situation is undoubtedly totally different than mine. My military friends can't build up a huge pantry when they have to worry about moving every three years. They can still get to a point where (except when they are about to leave) they could feed their families for a month or two, but planning for longer just isn't realistic. You have to do what works for you. I truly believe that EVERYONE should be prepared to eat well for a week though. Ethnic cookbooks can be great. I have a lot of Polish cookbooks, and those are fabulous for using some pretty inexpensive ingredients. There are lots of great ideas online. That's where I find most of mine, actually. Cooking here often involves me looking and thinking, "I have a bazillion great northern beans. And we got broccoli in our basket this week." Then I google "white beans and broccoli recipes" and end up with hits like Emeril's Noodles with Broccoli and White Beans. It calls for canned beans, but I'll substitute. Or if I get stuck, I post on Facebook. A plea like, "Help this northern girl figure out how to cook edible grits!" for instance, and I had a bunch of great recommendations. And I made grits that were not merely edible (which in itself would have been a huge improvement) but people went back for seconds... and it was requested that I make it again. I have no space for pantry unit so I bought just recently a pull out pantry unit for my kitchen cabinet. It helps a lot organize my groceries.